Ali's Bellevue Auto Repair gives you more services and handles more of your needs than most any auto repair shop. We handle those services that many mechanics make you go to a specialized, separate shop for, including transmission repair, wheel alignments, emission repairs and more. For this family-owned and operated business, it's a matter of complete service to our customers at a reasonable cost. You can lean on us for whatever you need and ultimately we keep cars running better for longer. 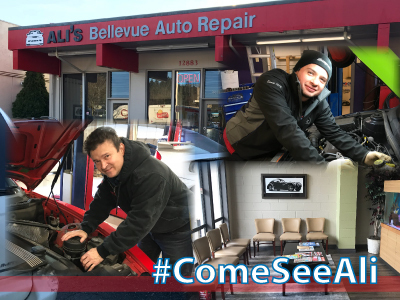 Two Decades of Auto Repair Service to Bellevue and the Eastside! We're ready to handle auto service for Bellevue WA and the surrounding areas. This is the kind of auto service folks can recommend to their friends and neighbors. 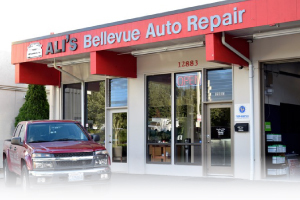 Ali's Bellevue Auto Repair, like our other shop Ali's Woodinville Auto Repair, offers the most services and expertise of any area auto shop. For example, we handle ALL brake repairs: replace worn pads/linings, turn or cut rotors and/or drums, adjust and bleed system, repack wheel bearings, replace calipers, wheel cylinders, and master cylinder. We are also proud to offer a complete professional diagnostic equipment. This helps us to make sure we get the problem fixed right and repaired the first time. For the diagnosis of engines and engine repair, we offer fuel injection system diagnostics, ignition system diagnostics, emission testing, and computerized engine controls testing.